Scientists have tested bread wheat cultivars released in the Ethiopian highlands to better understand the potential trade-offs between food and fodder traits (photo credit: ILRI/Apollo Habtamu). Mixed crop-and-livestock farmers in Ethiopia and other parts of sub-Saharan Africa increasingly depend on crop residues as a source of fodder due to the declining availability of grazing lands. As a result, improving both the grain and residue yields and quality of dual-purpose crops is of growing importance for livestock nutrition and productivity. Scientists from the International Livestock Research Institute (ILRI), the International Maize and Wheat Improvement Center (CIMMYT) and the Ethiopian Institute of Agricultural Research (EIAR) tested the productivity characteristics of bread wheat cultivars released in the Ethiopian highlands to better understand the potential trade-offs between food and fodder traits. Generally, genetic variation exists in fodder quality traits of crop residues and improvements in quality can be achieved, through plant breeding or simply reselecting within varieties, without negatively affecting grain yield. An initial 25 wheat varieties were investigated for grain and straw yields and fodder quality traits in 2016 in Debre Zeit and Kulumasa. Five of these varieties were then selected for further investigation in 2017 in four broader agroecologies. ‘We investigated the nitrogen (N), neutral detergent (NDF) and acid detergent fibre (ADF), acid detergent lignin (ADL) in vitro organic matter digestibility (IVOMD) and metabolize energy (ME),’ said Melkamu Derseh, an animal nutritionist with the Feed and Forage Development program at ILRI, who led the research. The study confirmed the presence of cultivar-dependent variations in fodder quality traits in the wheat varieties. ‘These variations can be exploited to optimize food-feed traits of cultivars used in the mixed crop-livestock system,’ said Derseh. 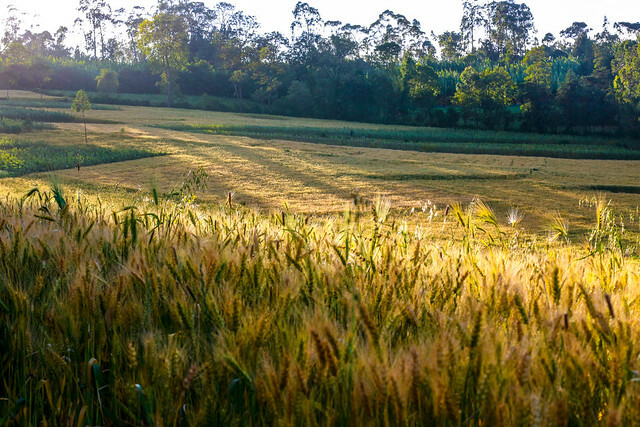 The scientists, however, found that the amount of variation in wheat fodder quality was lower than previously reported for wheat and other cereal crops. The researchers conclude that because of the significant scale of wheat cultivation in the country, the second largest in sub-Saharan Africa, and the smallholder farming context, a slight improvement in fodder quality traits of the newly released varieties will play an important role in enhancing livestock production and improving the livelihood of farmers in Ethiopia. Findings from the study were published in the August 2018 issue of Field Crops Research. Read the whole article ‘Variations in food-fodder traits of bread wheat cultivars released for the Ethiopian highlands’. Tags: CIMMYT, genetic variation, wheat. Bookmark the permalink.